29th oct- We took spicejet flight to jaipur but unfortunatley couldnot make it within time due to technical problems and traffic congestion we were made to wait for 3 hrs inside flight.We reached around 10.00pm to our prebooked hotel by prepaid taxi.On reaching hotel driver says "kya bekar hotel liya hain sir"....ughh lump in my throat as all booking was done by me. It was a laborious, monotonous job going through website after website, jotting down details regarding price.With heavy heart went in but found everything as per internet photos only.We asked for next day car-hire for Shekhawati daytrip which they arranged. A few more week we will move from our current address; this time within Bangalore. So compared to last moves it is going to be a very small one. In 2003, we crossed Atlantic (California to Paris), in 2006 we crossed Indian ocean (Paris to Mumbai) and in 2008 we moved within India (Mumbai to Bangalore). Now this is just 20 Km move within Bangalore city. 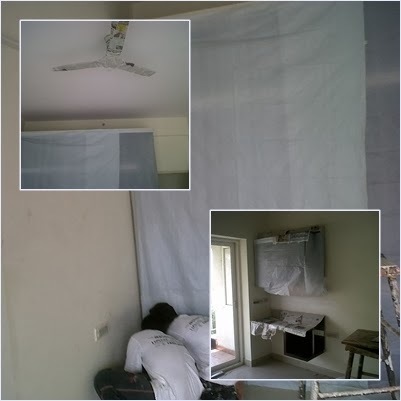 The painters from Asian Paint Home Solutions are doing the paint job and they are supposed to finish by 25th November. The color scheme is going to be primarily white with little variant on one major wall. Hope all things works out as planned. We just had a wonderful week long break in Rajasthan during diwali; Pamela is working on the travelogue. We are posting the pictures as we finish writing the details. All the bookings are done and big thanks to Pamela. Almost after one and half year we went for a long weekend out of Bangalore; our very first road trip of 2010. We were looking for something near to beach and thought of heading towards Pondichery but due to unavailability of any sea facing hotel we opted of Auroville. Certain thing really happens for good. The road was Bangalore -> Krishnagiri -> Tiruvanamalli ->Tindivanam-> Auroville. As usual Santanu had production outage @ work and went to sleep around 2 AM thanks to ‘new era new tool’ at work. Started early morning around 05.50; had breakfast at A2B (Krishnagiri) then around 07.50 we hit the road. Non stop drive to Pondichery and reached around 13:00. The road between Krishnagiri and Tiruvanamalli is undivided state highway with lots of pot holes. You need to be very careful as most parts of the roads are good but suddenly you get one big pot holes. Road between Tindivanam and Pondicherry is newly done 4 lane highway. 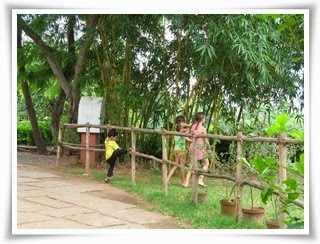 We booked our room at "Center Guest House" through the website aurovilleguesthouse.org just two weeks ahead. They sent letter confirming it and with fine prints where we were supposed to send the advance by Demand Draft now in the age of credit cards we didn’t pay attention to the bottom part of the mail till day before the trip. On contacting over phone they said to come over as there was no other booking. 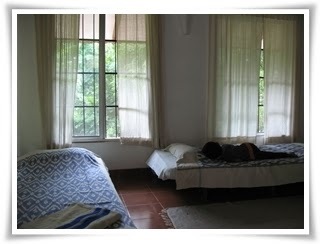 Their rates include meal for three times a day, bicycle and Yoga. . Its non-alcoholic and public smoking is strongly discouraged; it is not a place for vacation – most come here to meditate. 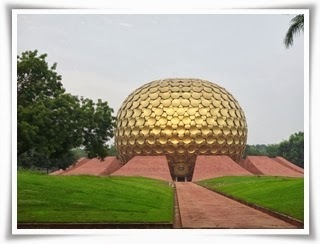 Most Indian come and visit the Auroville as day trip from Pondicherry. Me and my hubby fell in love seeing the place and particularly when they showed our room which is tucked between trees and you can see butterflies, birds. Was just mesmerized to see the greenery all around. Had Indian buffet lunch at dining hall and after relaxing for a while went out to look for cycle. The dining hall had two baby chairs as well which is so uncommon in India. 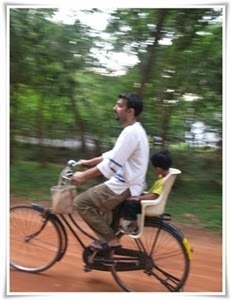 We found one cycle which had baby chair fixed; most cycles were tall and typical DESI type with hard seat. After maneuvering for a while I managed to get onto one finally as I am not used to these types of cycles; Voila... We cycled here and there without thinking much and looking at maps. Best part is they have so many trails that you will never be bored and the same time you will not be lost. The roads are in spiral in Auroville just like the Paris is planned. Greenery is all around, few houses and buildings with lots of shades from tress to make it more pleasant. If you feel you are lost in this forest ask anyone be Indian or foreigner they will guide you. Most residents or visitors are from France as you can hear French all around you. Its really place far off from city noise, pollution and traffic soaking in the best nature has to offer. Negative thing about Aurorville is you are forced to give up your fast paced city life. Everything gets closed for lunch even lots of the facilities are only available for those who stay longer like 8-10 days. If you stay longer you get an Auroville cards which is like a pre-paid cash card but gives exclusive access to some restaurants, café and others center like yoga. We went to the visitor center and spent a good amount time in the various boutique shops and picked a school bag for Aarush. Once it started to get dark we headed back to Guest House. We all had shower as this place is quite hot and humid. Had continental buffet dinner at night they do serve early evening between 7.00 - 7:30 PM. By 10.00 PM they expect to be pin drop silence so every one around is sleeping well. We also slept early. After breakfast we went to bicycle stand and found someone has taken away Pamela’s cycle and she has to find a new one all over again. Once we started paddling we decided to go beach. The ride was a smooth one but once we were off Green zone there were cars and as usual they did not have any courtesy for cyclist. The 8 KM long ride was fun. The access to the beach is not direct you need to access the trough a narrow lane. Both the lane and the beach are very dirty have not seen any thing dirtier than this. From beach we came to Visitor center and watched video on Matri mandir. For the first time visitor watching of the video is a must and after that one gets a pass to the vista point to see Matri-mandir. Inside access is rusticated but open to all who wish to meditate. After that we came back to guesthouse for lunch. Santanu decided against touching the car which means we had to postpone the trip to Pondicherry for the last day of the trip. We went out with the cycle around 4 went to Solar Kitchen to start with. As Solar kitchen only except Auroville cards we could only smell aroma of good food and see other enjoying with our stomach rumbling we left that place. After riding the cycle till dark we came back to guest house and called it a day. We started early with quick breakfast and checkout by 9AM and headed towards Pondicherry. The destination was French Quarter and Aurobindo Ashram. We paid a quick visit to the Ashram. Children under 3 years are not allowed. After walking around French quarter we went to a restaurant and Aarush had his breakfast brunch. There was nothing much to do in Pondicherry and we found it hotter than Auroville. We headed back to Auroville again for our lunch as we wanted to try Roma’s Kitchen. The food there was excellent one of the best pasta I had in India. The place is frequented by non-Indians and we noticed they all were having Indian dishes.We enjoyed our Pasta while Aarush was too busy running and playing with two French girls who were bit older than him. He was so happy that he was crying while we tried to put him car. By 14:30 noon we started from there; the drive was OK and we reached Krishnagiri by 18:30. But from there to Bangalore was long journey as there was a major accident on the road and we reached home at 21:30. If you are looking for a doing nothing kind of a weekend Auroville is great. The best part is as most visitor who comes here from abroad lots of small things like baby chair; clean bathroom is common. The food is bit blend in Indian context but we liked it. People are courteous and helpful. We had to extend our planned holidays as we got a last minute invitation for my cousin's marriage now both marriages were only 6 days apart. Personally was quite unhappy about the whole situation of attending two marriages; instead of voicing opinions, kept cribbing and ranting. Confronting such family matters does not work as no one is right. Anyways, at times you are forced to go along with such decision whether you like it or not. Plan to Sunderban trip was made by Santanu as we wanted to go somewhere around Calcutta not just one Wedding to start with. And now with extension of our holiday we were left with 2 more days in hand. 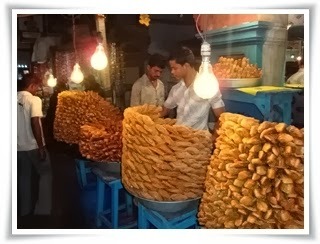 So after lots of thoughts and web browsing we settled unanimously for Puri - every Bengalis dream place or second home. Digha an eminent beach resort of West Bengal was shelved as everyone recommended against it. 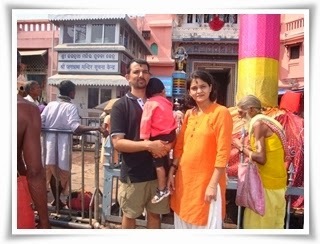 From Calcutta its one night train journey and reached Puri early morning by Puri express. Heard from lot of sources and found it in actuality too that all kinds of people will start approaching you ,offering help starting from getting hotel to visiting inside the temple by trying to rob you. Avoided these people as much as possible. We booked for Hotel Santana which was not sea facing but not far from sea. It’s located on C.T. (Chakra Tirtha) Road where most non-Indian prefer to stay. 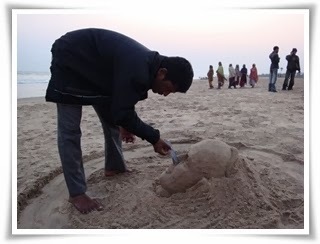 There are steady growth of foreigners in recent years who find beaches of Orissa are more tranquil compared to the famous one on western coast of India. 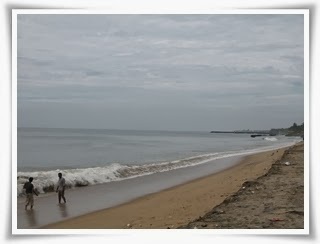 Puri beach front is divided in 3 sections starting from west you have the old hotels which are frequented by Bengali’s; the middle section is a no-tourist-land as there is a big gutter which opens at sea and at the end you have the C.T Road where new hotels are. First thing for us after reaching hotel was to visit Jaganath temple. We asked our hotel people to arrange for darshan. They did it within hours time very kind of them. They told us not to pay any exorbitant amount to that person just anything you wish should be fine enough. I didn't know before that non-Hindus are not allowed inside the temple. We had very smooth darshan despite lot of chaos and fight among police and pandas were going on just before closing of temple at noon. It didn't took much time too in queue compared to Tirupati. After darshan we decided to come back and had lunch as we were empty stomach from morning so had food at one Jain place with no onion and garlic. Then strolled around in the street near to hotel. It was quite hot and bit humid at day time so went back to room. Rested for a while then left hotel on foot around 4.00pm to walk along the beach towards bazaar. Till 8.00pm we were roaming around and then decided to come back as Aarush was to be fed which was our concern. In evening we had temple bhog which was huge chunk to be finished by two. You are not supposed to throw bhog we shared the untouched portion with our hotel staffs who were also happy to have it. 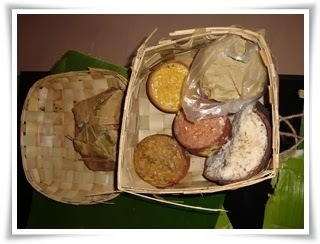 The Prasad is so holy that a Hindu Brahmin will eat the same even an un-touchable saves the same from a dog’s mouth. 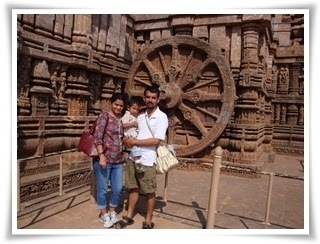 Next day at 8.00am we left our room for Konark by a Cab from hotel and on reaching the spot hired a guide. The Guide was well informed and very decent took around and an hour or so to explain and then we took our own time to look around. From there we came to Chandbaga (Konark gold) beach. Aarush jumped into sea and was not willing to come out but we convinced him somehow that in evening we will come again. We came back to city center walked around temple area shopped some Saris and had food there in one restaurant from where temple is seen very clearly. Did few shopping and came back to hotel. 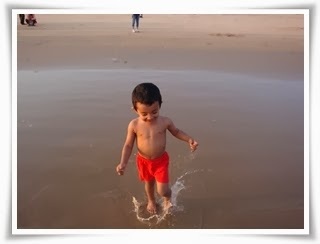 Then in evening as per our promise we took Aarush to beach and he was very happy. At evening its cool breeze which makes you to stay long then we came to street side food where we had fresh fish fry and hurried to hotel for Aarush before he gets cranky out of hunger. At late night boarded train back to kolkata. 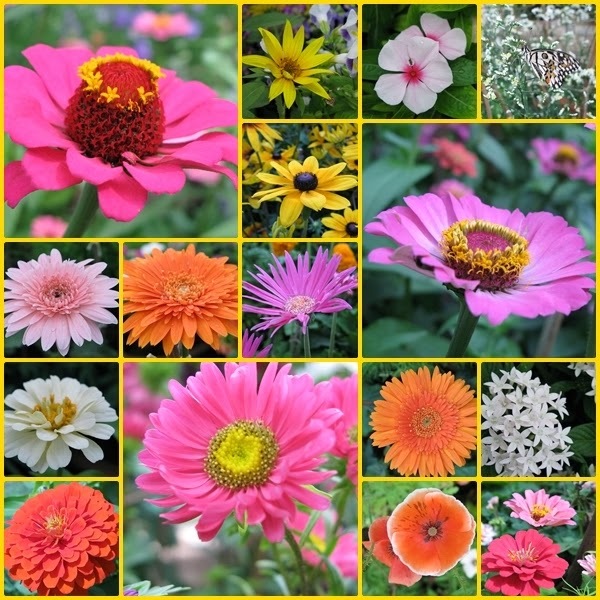 Finally went to Lalbagh flower show last weekend (8th Aug). Thanks to my work; was awake from 3 AM and had no trouble of getting ready early on Sunday. By 8:40 AM we reached; crowd just started to show-up there was not much problem of parking and all. As soon after we entered the main glass-house Aarush started to sneeze incessantly. Among many varieties of flower main attraction was off course the huge structure of India Gate made of roses; it was tribute to soldiers who lost their lives during the Second World war. There were many orchids but my camera failed to capture their beauty. We took a quick walk around because of aarush and within another 60 minutes or so we were on our way back. Half an hour later we realised that our li'l one is allergic to pollens probably. 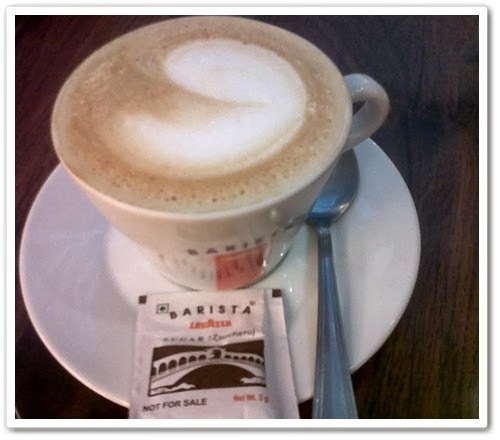 My addiction to coffee is not new and there are few posts on the same subject in past. The culture of having a good time with a cup of coffee is catching up in India. Café Coffee Day aka CCD is expanding its footprints in rapid speed from past few years; people close to the business speculate they are just spending money and expanding in hope for a bought over by some FDI like Starbucks if the later enter Indian market. Personally prefer Barista (inside Leela hotel more presice) more for the ambiance then the coffee. This chain has changed ownership a few times and their service is not consistent across franchises. The croissant I had in Mumbai airport last Wednesday felt like chewing gum.Now there are few entries to the market like Cuppa, Costa. Went to Cuppa(in Benarghata road) few months back after dinner with friends and were quite disappointed as they did not had any wine that we asked. Felt like they wanted to push some open bottled wine and my experience with coffee was not great either. 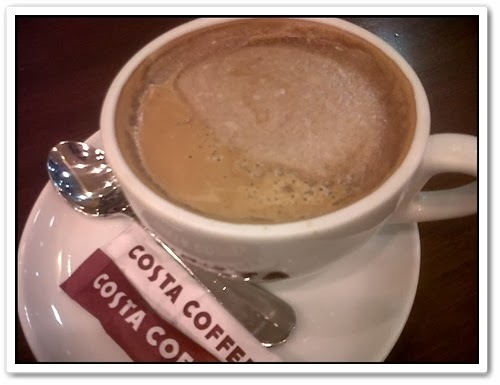 Last Tuesday while in Mumbai went to Costa coffee for the first time and I must admit their coffee was really great. The price is bit higher from CCD but very much like Barista now need to see if they can hold on to the quality as they expand within India. Some update from previous post . Till far we made numerous trip on weekdays and weekends. 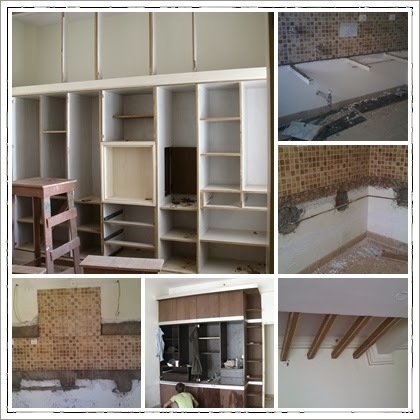 We are almost done as far as carpenter work and civil work is concerned. There are still few things pending but we can wait for now. 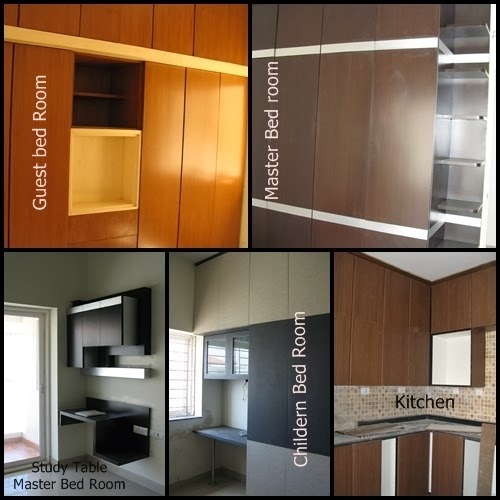 The next major one and obvious ones are hardware and shower enclosure fixing at bathrooms along with painting and electrical fittings. We need to make all the necessary holes for pictures and wall hanging before final painting work. Hope to complete religious house warming (griha pravesh) in July and wait till year end for final move. The past weekend was very low key just wanted to laze around to be honest. It was great to watch to few late nights World Cup Football matches live with Jishu. Saturday went to usual vegetable market at HAL. After a quick and early lunch we went to southern part of Bangalore to drop Jishu back home. It started to drizzle at first and very soon it was pouring by the time we reached BTM layout. 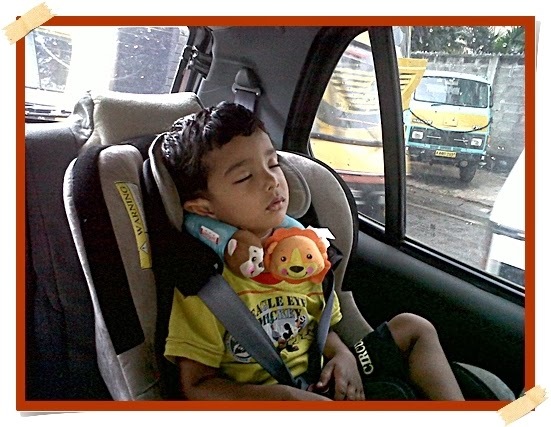 The traffic started to move in snail pace and meanwhile Aaarush dozed off while seating in his car seat. So from BTM we went to checkout Oyster Bath Concepts at Jaynagar showroom. Luckily the rain stopped and we left Aarush for 5-10 minutes while sleeping as car was parked right infront of the showroom. From there wanted to go to Commercial Street as rain almost stopped. But on the way it again regained its power and was splashing water all over. So we decided to keep our feet dry and head towards home. It was a long detour to reach home to be honest and only person benefited was Aarush as he completed his afternoon nap. So at the end instead of going directly to home we went to Sambit’s place and had a good time there. Well another small post with pictures. These pictures of Aarush are months apart. One on left with motorcycle are just after his tonsuring and on the right are just weeks old. He really likes to ride like any other boy. And if we try to stop him it does not go well at public place. When we were in Star Bazaar @ Kormangala few weeks back he remembered where this toy car was kept and every time we tried to refrain him he used to go back there. It was surprising that he remembered where the escalator was and went up all the way navigating those aisles of merchandise from the lower floors. 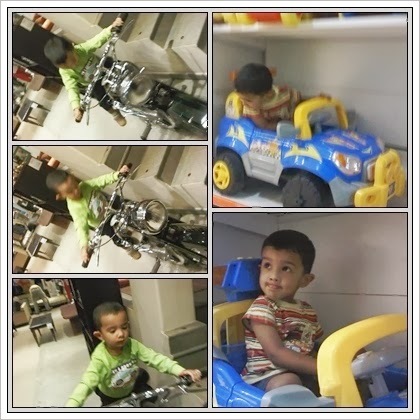 Recently, we bought him a cycle from Fisher-Price which he rides inside home all the time. The picture of that is there in this album will try to capture a video some time soon. If long hours in office and the phone calls at 2AM does failed to keep me busy this is another Work in Progress which is keeping me recharged.